Can't blow your minds this week...must work on a few less interesting real life projects. 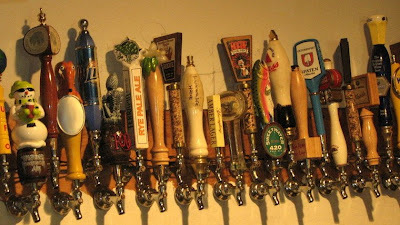 However, here's a fun topic: What's your favorite local, Deep South beer and bar? If you don't drink... eff yourself, health freak. It's just so good when it hits your lips! 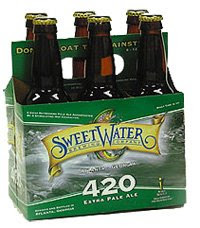 Sweetwater 420 out of the 770/404... I have neither the time nor the inclination to describe the aroma, the hoppiness or the head of this beer like all the fabulous beer knerds over at beeradvocate. I just know it's effin good. I don't get out to "the club"...at all. I barely go out, except when some college friends come in town and what not. I'd much rather grill and drink in the comfort of my own or a friend's backyard. So, if I have to actually go out, I want it to be as close to that backyard experience as possible. That's why I love The J Clyde. It's like your backyard, but better. You don't have to clean up all those beer tops and cig butts the next day, plus it's just cool. Think: a beautiful, beneath the oaks back patio with subtle live music, the best beer selection in town, a friendly crowd and no damn cover charge. AKA, a heavenly Southern beer garden. Doe's in Greenville (the original). OK, I realize it's not actually a bar, but they do serve beer there (I still can't fully understand some of the quirky MS liquor laws), and you "get to" bring in your own wine (or whiskey, or whatever). That has two advantages--you get to have free reign on your choice, and you don't wind up paying double the price. Despite it's appearance as a "family restaurant", I offer it up here because every trip there winds up being a marathon meal that involves a lot of drinking. Isn't that what it's all about? Plus, the bathrooms rival anything I've seen in a college bar. Aside from that, I'm with you, Erik. Give me the backyard with a hot grill and an ice cold cooler, and I'm happy. favorite deep south beer=abita amber...though i love pretty much every abita beer not named turbodog or purple haze. favorite bar=well the abita brewpub of course...mainly b/c you can buy 1/2 gallons of your favorite abita beer. the gingerman here in dallas is always a good time too. I am a big Abita fan but the new Lazy Magnolia brewery in Kiln, MS (home of Brett Favre) makes a dark ale called "Southern Pecan" which is flavored with, you guessed it, roasted pecans. It's thick, smoky, holds a good head and (most importantly) delicious. My favorite bar would have to be Parrish Baker's Pub in Oxford, MS because of Whiskey Wednesdays. Any whiskey drank you want for a mere 3 bucks (this includes single barrel you-name-it on the rocks). located in Decatur, GA. better beer selection than Milltown, but the food is not quite as good, and outdoor seating is restricted to about three tables. bonus points: two bars. one for belgian style ales, one for all others. too easy... Blue Heron from Lazy Magnolia. Bar: Parrish's or the Burgundy Room in Oxford. I was tempted to go with a Lazy Magnolia beer as to support a budding Mississippi business, but it would be a lie at this point. The only one i've tried is Southern Pecan, once, so who am I to judge? I haven't had the full Lazy Magnolia experience. It's just now starting to expand in Birmingham. artiger, I gotta get to doe's. I've never been. Happiness is a warm steak. And I wish Birmingham had more BYO-Alcohol establishments. That's one thing Mississippi got right. This isn't a Southern beer as it is brewed in Colorado but I think it will come in handy to all SEC tailgaiters come the fall. Look for Dale's Pale Ale. It is a great beer very similar in taste to Sweetwater 420 but comes in a can which makes it more practical for occasions when bottles are a hassle deal with because of their bulk. Great taste and the convenience of a crushable can for the tailgate trash bag. Erik, if you make the trip, be sure to hand a fiver to the security guard in the "parking lot" (aka, the curb) before walking in. A ten if you drive something nice.